I've discovered a pattern with the Mission: Impossible films that I like: it's the odd numbered ones, as I think the first is still the best, found the second one average, really liked the third, and then hate-watched the fourth due to it crossing the line into sci-fi territory too much for my liking and wasting Léa Seydoux, among other things. I found Ghost Protocol was so overrated and cartoonish, I'd have rather rewatched M:I 2 again. After seeing this latest installment, I'd have to rank the films as follows (from best to worst): 1, 3, 5, 2 and lastly 4. A good thing about the films is each one's more or less standalone (with some connections from film to film in the last few). With each new director, they've put their own stamp on the franchise, some faring better than others. Thankfully, I found this one less boring/forgettable than the last. While Rogue Nation certainly doesn't match Brian DePalma's original classic spy thriller movie or J.J. Abrams' exciting but emotional third film, it is certainly better than the other two. 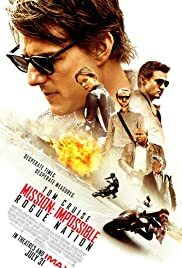 The gist of this film is Ethan Hunt and his team taking on the Syndicate, an International rogue organisation committed to destroying the IMF. The opening features Tom Cruise, as Hunt, performing his own death-defying stunt, climbing on the outside of a flying plane without the use of special effects or a stunt double...so it's easy to see why he apparently injured himself 6 times during the making of the movie. Although this scene has been heavily promoted, Cruise deserves all the credit he's getting for performing it. Say what you will about him, he at least puts LOTS of effort in - which is appreciated in these days of heavy reliance on CGI. Those put off the M:I movies simply because of the craziness that is Tom Cruise should give this one a chance. He's also, from time to time, actually *good* in things, and the M:I movies are an example of him at his best. Not to be outdone, Simon Pegg (along with Cruise) performs his own driving stunts - which, when you see them, is quite the feat. There's also what we've come to expect from Cruise in these movies: him running, on a motorcycle (though not running *on* a motorcycle...at least not yet), without a shirt, and having a shout-y moment. After the thrilling opening sequence, the following scene involving Hunt, a character simply credited as 'Record Shop Girl' and the film's baddie (who's not up to Philip Seymour Hoffman in M:I 3 standard, but is at least more menacing/memorable than M:I 4's bad guy) is surprisingly effective on an emotional level, given that Hunt and the girl only share a brief exchange. It's remembering to give the film these character moments that helps elevate it from being just non-stop action sequences with no heart. The scene is also important in regards to near the end of the film, and consequently the payoff is quite satisfying. While I felt Simon Pegg's Benji character was a bit overused in the last film, and relied too heavily upon for laughs, I think this movie - while still heavily featuring him - dialed things back a notch and allowed the character to have some strong character beats amongst all the funny lines/moments. One could say that the 'bromance' between Hunt and Benji is the emotional core of this film. Both actors are believable with the friendship they convey, and it's nice to see Pegg given some genuinely dramatic moments to play. For Jeremy Renner fans, his character doesn't do much in the first half of this film besides trying to remain loyal to both Hunt and the agency he works for (although he has some humorous moments with Alec Baldwin's Hunley). It's in the second half that Brandt gets in on the action, along with fan favourite, Luther. At least Ving Rhames gets to do more here than the last film. 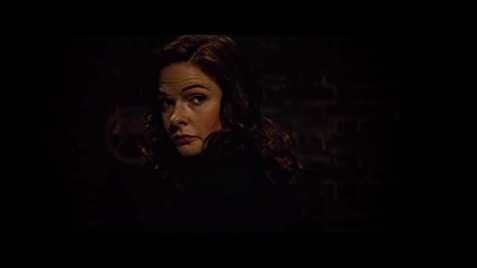 Of particular note is the new addition of Ilsa Faust (Rebecca Ferguson, making one hell of an impression in her introductory scene). Apparently she was 'unanimously the second choice for the role, as the studio, Cruise and director Christopher McQuarrie liked her work on The White Queen' (which I too have seen and really enjoyed her in)...so I guess we can thank Jessica Chastain for declining the role first offered to her, as Ferguson proves she's more than fit for the part. Ilsa has it all, she's intelligent, mysterious, deadly, cuts quite the fine figure in the yellow dress she wears on a mission to the Vienna Opera (but remembering to remove her high heels when hitting leg it mode - or rather, having Hunt remove them *for* her) and, above all else, can kick all sorts of arse (whether it be hand-to-hand combat with knives or without, sniping, or riding a motorcycle in a high speed chase) whilst looking credible doing it. She more than holds her own against Cruise's Hunt and is a far more fleshed-out character than others who have come before (save for perhaps Michelle Monaghan's Julia - who I also enjoyed). With her ability to do action sequences believably, look amazing and actually *act*, Ferguson's the whole package. Both her character and her dynamic she develops with Hunt are complex, and she virtually steals the film. While I think the franchise reached its peak with M:I 3, this film comes pretty close to matching it - which is quite surprising, considering most franchises tend to peter out by the third film in the series. Rogue Nation includes the best elements from some of the previous films - action, intrigue, humour, tense moments and heart - all rolled into one, and it's not too long. The inevitable next installment is going to find it hard to live up to this film, but so long as they bring back the main players from this one, it might not be...impossible.